It was a pleasure meeting you yesterday. 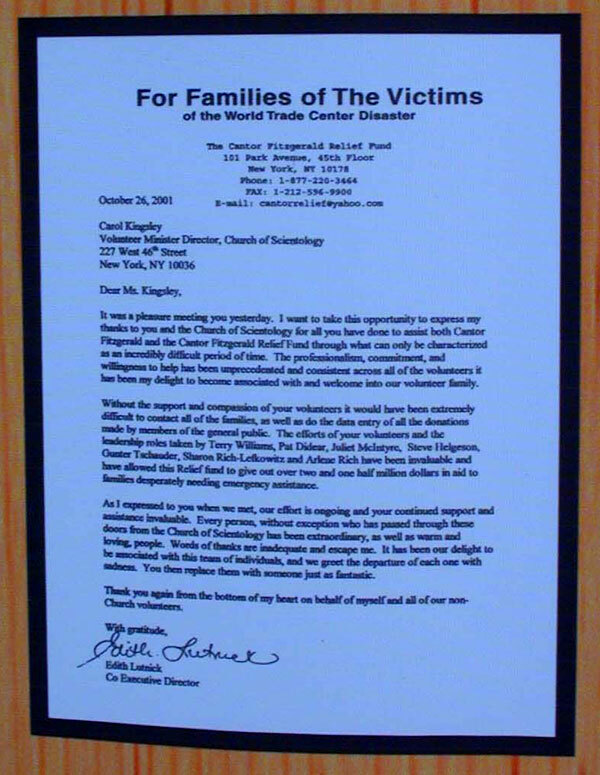 I want to take this opportunity to express my thanks to you and the Church of Scientology for all you have done to assist both Cantor Fitzgerald and the Cantor Fitzgerald Relief Fund through what can only be characterized as an incredibly difficult period of time. The professionalism, commitment, and willingness to help has been unprecedented and consistent across all of the volunteers it has been my delight to become associated with and welcome into our volunteer family. Without the support and compassion of your volunteers it would have been extremely difficult to contact all of the families, as well as do the data entry of all the donations made by members of the general public. The efforts of your volunteers and the leadership roles taken by Terry Williams, Pat Didear, Juliet McIntyre, Steve Helgeson, Gunter Tschauder, Sharon Rich-Lefkowitz and Arlene Rich have been invaluable and have allowed this Relief fund to give out over two and one half million dollars in aid to families desparately needing emergency assistance. As I expressed to you when we met, our effort is ongoing and your continued support and assistance invaluable. Every person, without exception who has passed through these doors from the Church of Scientology has been extraordinary, as well as warm and loving, people. Words of thanks are inadequate and escape me. It has been our delight to be associated with this team of individuals, and we greet the departure of each one with sadness. You then replace them with someone just as fantastic. 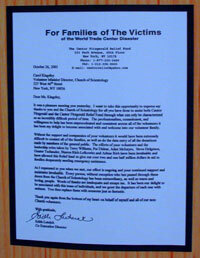 Thank you again from the bottom of my heart on behalf of myself and all of our non-Church volunteers.